The Purpose of the American Public Works Association (APWA) is the advancement of the theory and practice of the design, construction, maintenance, administration, and operation of public works facilities and services; the dissemination of information and experience upon, and the promotion of improved practices in public works administration; the encouragement of the adherence by public works officials to a high professional standard; and the professional and social improvement of its members; and the promotion of cooperation among all public, quasi-public, and private persons, firms, corporations, bodies, utilities, and agencies which have interests in the field of public works. Sign up or Sponsor 2018 APWA Golf Tournament Today! 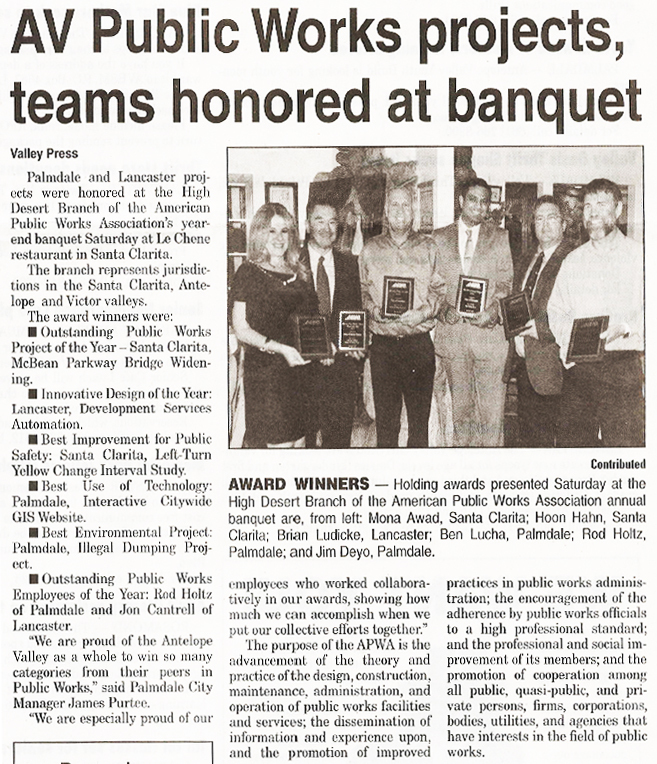 Copyright 1999-2019 High Desert Branch of Southern California Chapter of American Public Works Association. All Rights Reserved.